Apple on Friday released its free iPhone 4 case program in the form of an iPhone app. If you own an iPhone 4, you can use Apple’s new iPhone app to select a free case from Incase, Belkin, Griffin, or Speck—but which one to choose? We're working on getting some review units, but for now, here’s a quick overview of each of the cases to help you make a decision. I have a few quick notes before we begin, though. After surveying the manufacturer sites (we’re working on getting actual review units), it looks like these cases offer generally the same designs with some subtle differences and manufacturer style and quality distinctions. None of them offer quick-access for docking your iPhone 4, like Incase’s Slider Case does; you will have to complete remove the case when—or if—you want to use a Dock. They also do not include separate screen protector stickers or built-in, multi-touch-friendly display protection; they're all open-faced. Some of them cover and protect the iPhone 4’s power and volume buttons with their own press-through buttons, and some expose Apple’s buttons through simple cutouts. That's a trade-off of protection and a little bulk versus a slimmer design, but it's worth noting in case you prefer one over the other. But without further ado, let’s take a look at Apple's free iPhone 4 case lineup. The iPhone 4 Bumper ($30, black) arguably dances on the definitive line of being a “case,” as it literally is a bumper for the iPhone. It’s a fitted ring of plastic—no front and no back—that wraps around the outside of the iPhone 4, covering the stainless steel antennas and offering press-through buttons for power and volume. It does, however, offer a millimeter or two of clearance to lift the iPhone 4’s glass sides off of a flat surface. If you’re looking for a minimum level of protection against wear-and-tear, a way to mitigate the potential for signal attenuation, or simply a way to differentiate your iPhone 4 from your significant other’s, this is a good option. The Shield Micra for iPhone 4 (price unavailable, clear) is a clear plastic case from a popular accessory maker. Belkin says it’s an ultra-thin, lightweight case, and it offers press-through button protection for power and volume controls. It looks to have a glossy, rounded finish throughout, so it should be quite friendly to slipping in and out of pockets. 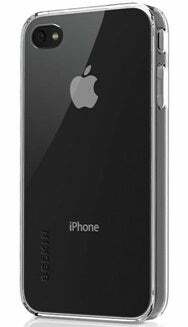 Griffin claims that its Motif for iPhone 4 ($20, Diamonds/Smoke) uses a scuff- and tear-resistant material that is stiffer than its silicon FlexGrip cases, but more flexible than hard polycarbonate cases like the Reveal Etch (below). It’s not quite a clear case—it’s translucent with a smoky tint, a diamond design on the back for style, and individual cutouts for the power and volume buttons. The Reveal Etch for iPhone 4 ($30, Black/Black Graphite) sounds like it’s Griffin’s take on combining the Bumper design with a full-body case. It has a polycarbonate back with a diagonal etch design for style and rubber siding all around for a touch of grip-friendly texture. Power and volume buttons are protected with press-through counterparts. 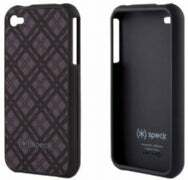 We do not yet have a lot of information on the Incase Snap Case for iPhone 4 (price unavailable, Smoke, Clear), but if you’ve never heard of the company, you can often find its products in Apple retail stores, as it makes quality accessories and carrying cases mostly for Apple gear. The Snap Case sounds like it has a two-piece design—one as a frame around the front, one to protect the back—as opposed to Incase’s Slider Case which, as the name suggests, requires you to slide the iPhone in and out of its sleeve-like design. I wager that the snap case uses cutouts for the iPhone 4’s buttons, which probably allows its overall design to be a little thinner. The Fitted Case ($30, Black Tartan) is a hard-shell case with a distinctive matte cloth texture on the back. My wife actually owned the previous version of this for her iPhone 3GS. It’s a good case—it snapped quite tightly around her 3GS, and the matted cloth style in the back is a unique touch. Speck employed cutouts to expose the iPhone’s buttons, which means the case is probably pretty thin and form fitting. The PixelSkin HD ($30) case takes a texturized approach, wrapping the iPhone 4 in grippable plastic and an iconic pixelated motif on the back. Instead of cutouts for the power and volume buttons, the PixelSkin HD covers and protects them with what I believe are rubberized press-through buttons built into the case. This will add a millimeter or two of overall size to the case, but then your buttons will incur less wear-and-tear and collect less grime.